It seems that the Michael Jackson concert behind the scene will be opening very soon but only for two weeks and the dates are set this coming October 28, Wednesday. Here are some more details regarding the upcoming memorial film for the King of Pop. Sony Pictures Entertainment and Sony Music Entertainment announced that “Michael Jackson THIS IS IT” will be released exclusively for a special, limited, two-week engagement worldwide (including the Philippines), with the studio pushing up the debut of the film by two days, to Wednesday, October 28th. Separately, the producers of “Michael Jackson THIS IS IT” announced that Kenny Ortega has been set to direct the motion picture. The film is being produced with the full support of The Estate of Michael Jackson. 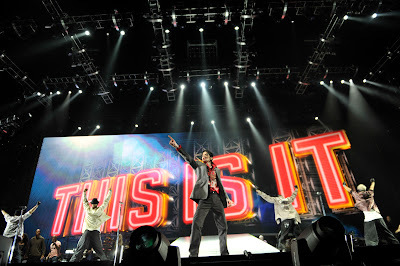 Commenting on the announcement, Ortega, director of and Jackson’s creative partner on the “THIS IS IT” concert, said, “This film is a gift to Michael's fans. As we began assembling the footage for the motion picture we realized we captured something extraordinary, unique and very special. It’s a very private, exclusive look into a creative genius’s world. For the first time ever, fans will see Michael as they have never seen him before – this great artist at work. It is raw, emotional, moving and powerful footage that captures his interactions with the `THIS IS IT’ collaborators that he had personally assembled for this once in a lifetime project. “Michael Jackson THIS IS IT” will offer Jackson fans and music lovers worldwide a rare, behind-the-scenes look at the performer as he developed, created and rehearsed for his sold-out concerts that would have taken place beginning this summer in London’s O2 Arena. Chronicling the months from April through June, 2009, the film is drawn from more than one hundred hours of behind-the-scenes footage, featuring Jackson rehearsing a number of his songs for the show. Audiences will be given a privileged and private look at the singer, dancer, filmmaker, architect, and genius as he creates and perfects his final show. In the coming weeks, additional information about the film will be available at http://www.michaeljackson.com. Dubbed the Billion Dollar Maestro by Daily Variety, Kenny Ortega has conquered feature films, television, stage, concerts and massive live events such as The Olympics with equal excellence. As Michael Jackson’s director and creative partner on “THIS IS IT” as well as the previous Jackson concert tours “Dangerous” and “History,” Mr. Ortega has been a friend, trusted colleague and collaborator of Michael Jackson’s for over 20 years. Now, are you excited. So do I. The moment I blogged abot the film in my blog, many people are now asking me if the tickets are already available. People are so excited to see this and with the limited time screening surely all the theaters will be full of MJ fans. “Michael Jackson THIS IS IT” is distributed in the Philippines by Columbia Pictures, local office of Sony Pictures Releasing International. Visit www.sonypictures.com.ph to see the latest trailers, get free downloads and play free movie games.